Day trip to Gavi – This is a day trip from 6AM to 4PM. Currently there is no option to book online and you will need to go to Kumily(Thekkady) to book this. 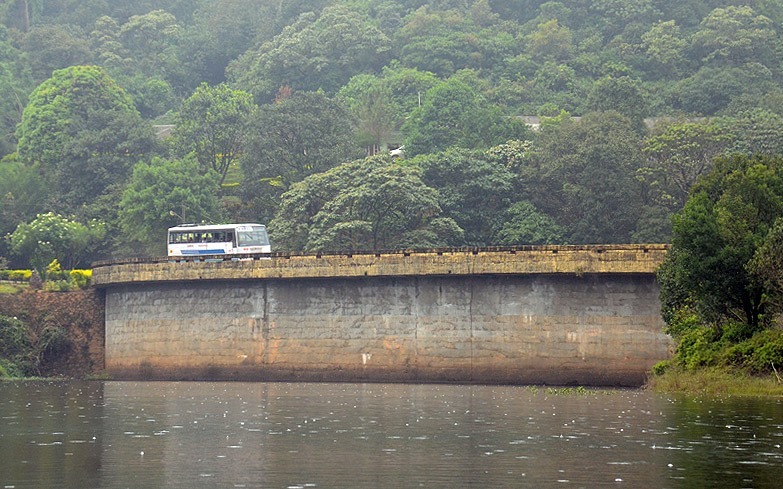 This is usually opted by tourists coming staying in Thekkady. For more details, check with KFDC contact numbers. 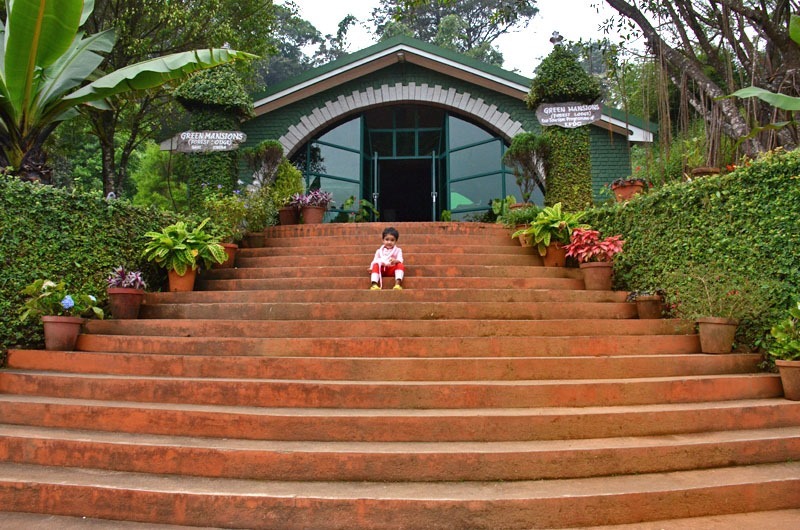 Green Mansion Lodge Stay – Overnight stay at Gavi in rooms. This is quite near to the Gavi lake. Swiss Cottage Tent Stay – Overnight stay in tents which are protected by electrified fence. More privacy and a relaxed forest stay is offered here. This place is located before Gavi dam. 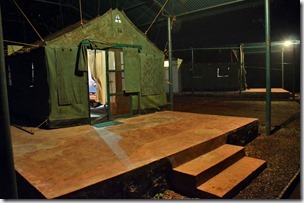 Jungle Camping – Up to 4 persons can stay in deep jungle after trekking to the location. 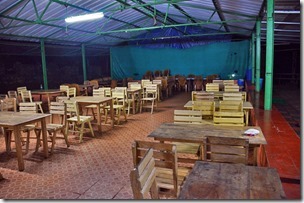 All programs include food and a number of free activities (trekking, jeep safari and boating). Up to date details of these programs including tariff are available at the KFDC Gavi website. Gavi has no other facilities (apart from a small local hotel in the nearby Gavi village). Also before you plan your trip, always call up the KFDC contact numbers to confirm program details. Usually you need to pay the room tariff up front by transferring money to KFDC bank account and cancellation charges are pretty high. You also need to inform them about your vehicle number one day before your arrival at Gavi. 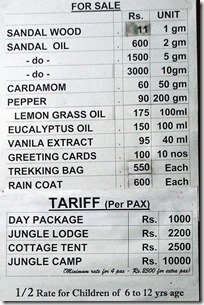 The per person tariff is around Rs.1000 for day trip and Rs.2000 for overnight stay. 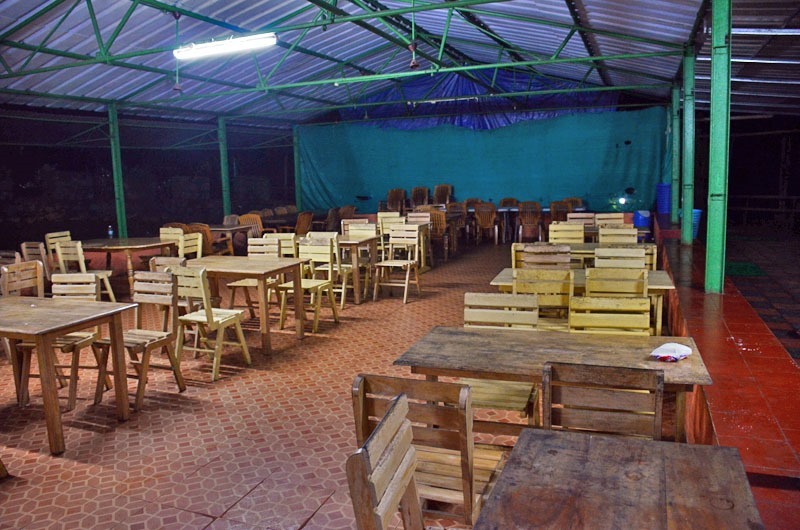 Facilities at Gavi include the KFDC restaurant, a small eco shop at the KFDC reception from where you can purchase a limited set of items (see photo), a small library and cell phone coverage only for BSNL mobiles. 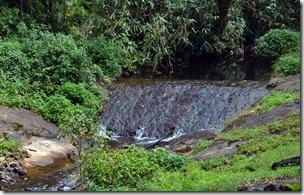 Gavi is a forest village inside Periyar Tiger Reserve and is part of Pathanamthitta district. 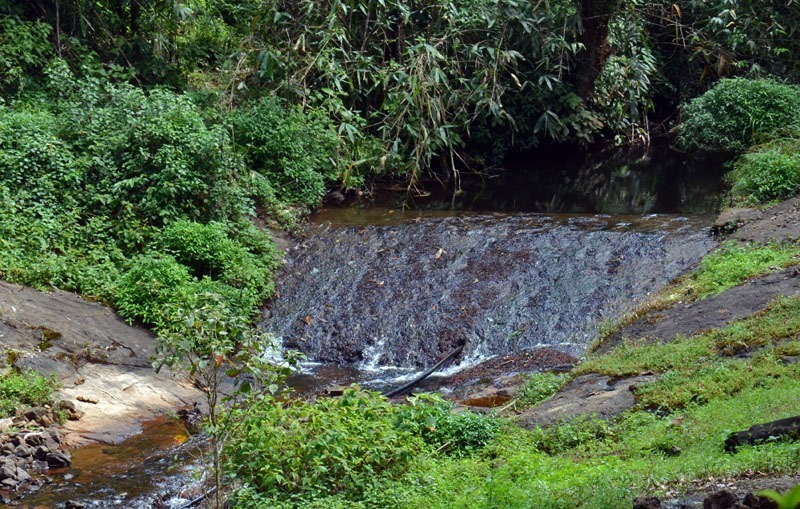 It is accessible by road from northern Vandiperiyar town and from southern Angamoozhy village. The Gavi ecotourism spot which includes the Gavi dam and Gavi lake is located about 500m away from the Gavi village. 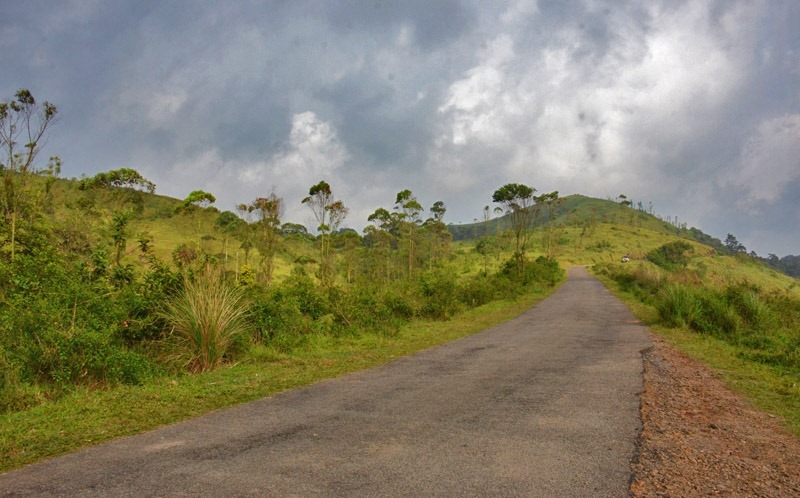 Gavi is located about 28KM from Vandiperiyar town and about 55KM from Angamoozhy village.The entrance from Vandiperiyar side is very restricted. 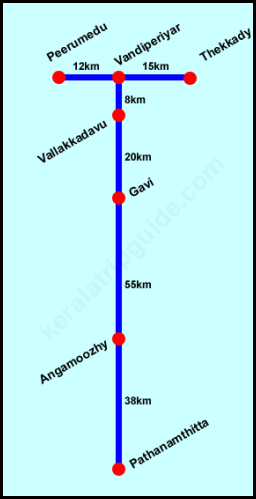 Only vehicles with prior permission is allowed to cross Vallakkadavu check post located about 8KM from Vandiperiyar and about 20KM from Gavi. 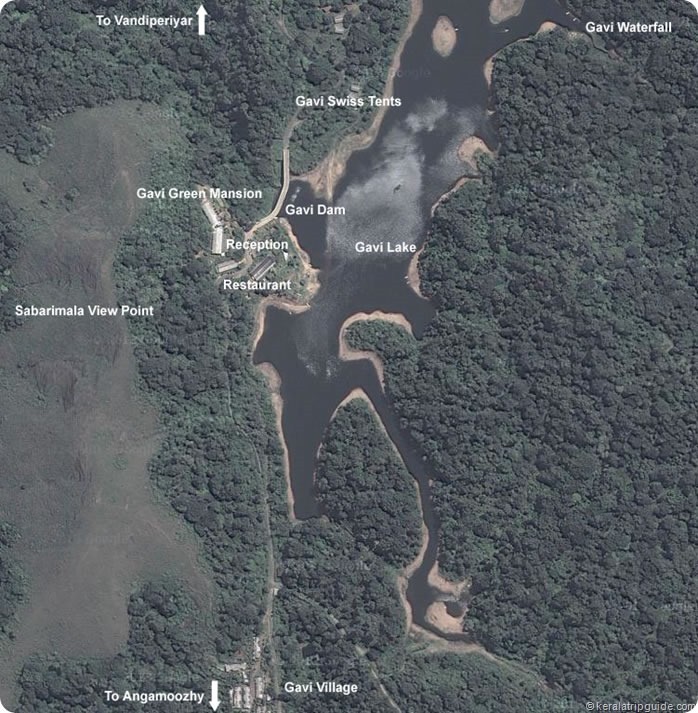 This restriction is due to the fact that forest areas here belong to the Periyar Tiger Reserve. The entrance from Angamoozhy historically has been much more lenient since it doesn’t belong to the Tiger reserve. However due to the sudden influx of tourists via Angamoozhy after Gavi was featured in Malayalam movie "Ordinary", now entry restrictions are in place. Now only 10 vehicles are allowed entry during weekdays and 30 vehicles are allowed entry during weekends. This entry is only allowed between 6AM and 12PM. The vehicles entering from Angamoozhy are not supposed to exit from Vallakkadavu unless they are guests of KFDC (they issue exit and entrance pass for their guests). Forest department is also planning to completely block entry of private vehicles from Angamoozhy once forest department starts their own bus safari till Gavi. This sort of bus safari is usually complete waste of money as I have seen the same in Siruvani (Palakkad). 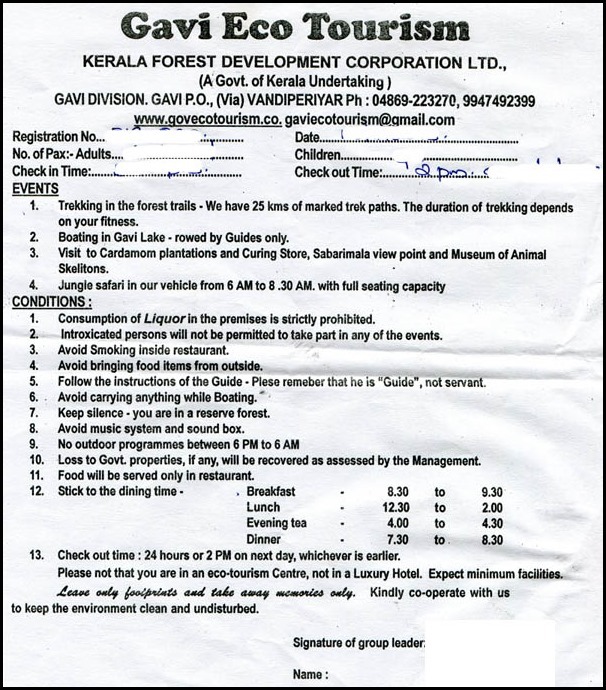 If you have booked a KFDC Gavi Ecotourism package, you are supposed to enter Gavi via Vallakkadavu check post. KFDC sends the entry pass one day before your arrival to the check post. The entry fee at Angamoozhy Kochandi check post is Rs.50 for car. At Vallakkadavu check post the entry fee calculation is bit complex and it took the officer on duty sometime to calculate it! There is a per person entry fee (Rs.25 for adults and Rs.10 for children), vehicle entry fee (Rs.50) and then camera entry fee (Rs.25). Gavi Lake Boating – This is paddle boat trip to a nearby waterfall in the Gavi lake. life jackets are mandatory and the guide will take you in the boat. 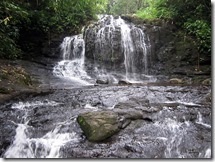 Trekking Around Gavi – There are around 25km of trekking path in and around Gavi. Usual trek path goes around the jungle on the other side of the lake returning back to the main road and then crossing over to the Sabarimala view point. Jeep Safari Along the Jungle Road – The early morning jeep safari is usually from 6AM to 8:30AM and covers Gavi village, Kochupamba etc. towards Angamoozhy. They usually cover about 15 to 20KM along this stretch. Visit to Sabarimala View Point – This is very close to the Gavi reception area and is a 15 minute uphill walk to a meadow. You can see Sabarimala usually partially hidden among the mist. Ponnambalamedu mountain can be seen on the left and pullumedu mountain can be seen on the right. You can also see the road to Vandiperiyar from here. Take a binocular if you have one. Visit to Animal Museum – There is an animal museum nearby. We never got time to visit it! 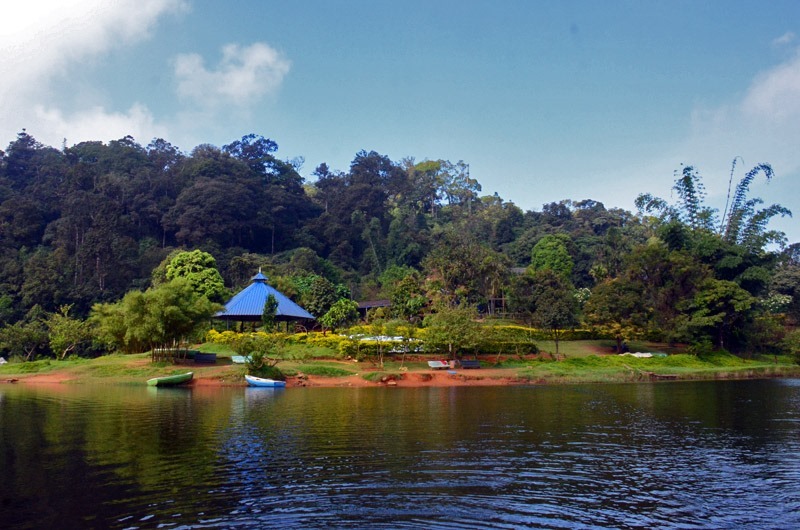 In addition to the above there are activities available near Gavi such as boating in Kochu Pamba lake and jungle stay. Ask at reception for details of these. 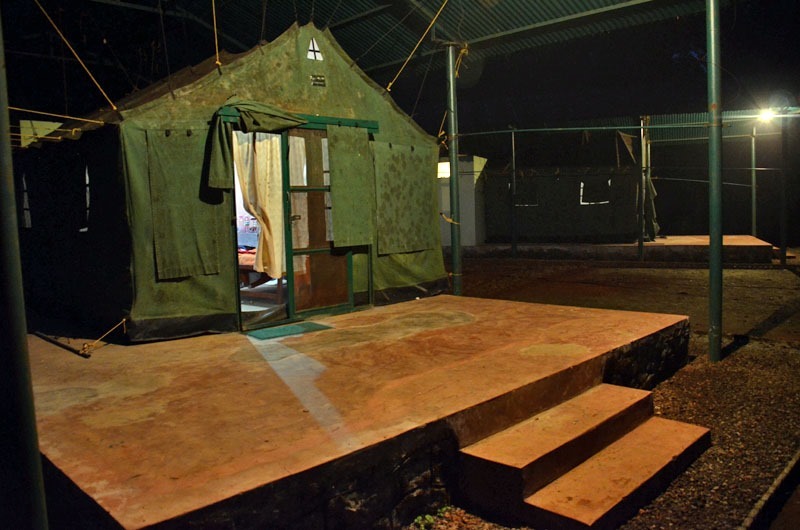 It appears that the addition of Gavi into the Tiger reserve has put a brake on the expansion of eco-tourism activities. The following map will give you an idea about Gavi geography and where activities are organized. 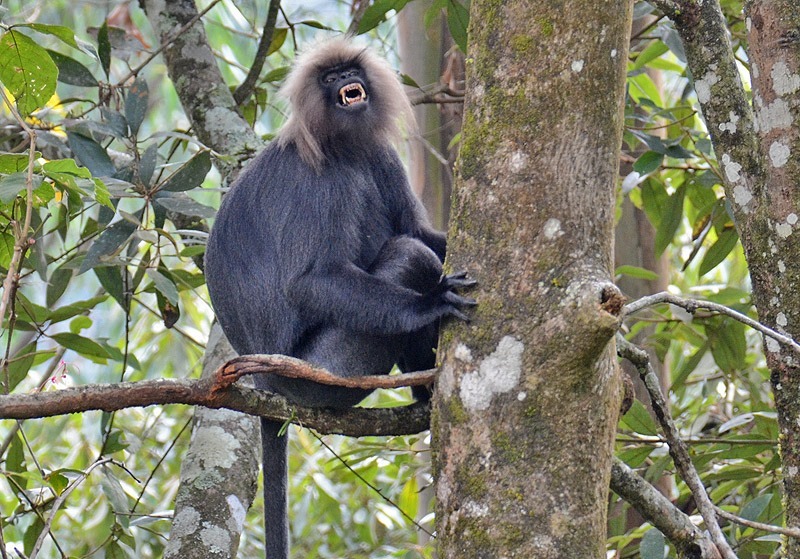 Malabar Giant Squirrels, Elephants, Sambars, Gaurs, Lion Tailed Macaque, Barking Deers, Mongoose, Nilgiri Marten, Civets, Bears, Wild Boars, Wild Dogs, Leopards, Nilgiri Tahr, Nilgiri Langur etc. Great Indian Hornbill, Malabar Grey Hornbill, Malabar Whistling Thrush, Blue Winged Parakeet, White Bellied Fishing Eagle, Brown Fish Owl, Forest Eagle Owl, White Shouldered Kite, Crested Serpent Eagle, Parakeets, Bulbuls, Wayanad Laughing Thrush, Skylarks and Pipits, Sunbirds, Mynas, Woodpeckers including Great Black Woodpecker, Kingfishers, Flycatchers etc. In November 2013, My brother and I decided to visit Gavi along with family. A week before our planned date I called up KFDC office at Gavi and asked for availability of tent accommodation. He replied that tents are available and in order to book them I need to transfer the entire tariff to their Vandiperiyar bank account. That seemed a bit scary, but there are no other options available at Gavi and since KFDC is a government run facility I decided to take the risk. I made a NEFT bank transfer to KFDC bank account for booking 2 tents at Gavi and called up KFDC to confirm my stay. I was asked to call one day before our check-in date and inform our vehicle number. This is required for them to arrange vehicle passes at Vallakkadavu forest check post. KFDC, Account No: 362801010021042, Union Bank of India, Vandiperiyar. The IFSC code is UBIN0536288. Needless to say always double check the account details before you do the money transfer. The details given here are only for double checking what you heard from KFDC contact numbers! We started early morning from Ernakulum and headed towards Vandiperiyar. After a slow drive through scenic KK road and a quick visit to Pattumala church we reached Vandiperiyar just in time for lunch. Our check-in time at Gavi was 2pm and the package included evening tea, dinner, breakfast and lunch (next day). We had our lunch in Vandiperiyar and then proceeded to Gavi at around 2pm. At Vallakkadavu check post our entry pass was ready. We had to pay entry fee, vehicle fee and camera fee at the check post. 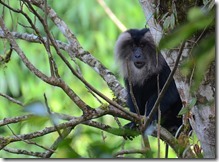 The 20km drive from Vallakkadavu to Gavi is through thick jungle which is part of Periyar Tiger reserve. This stretch offers excellent opportunity to see wildlife. After a couple of Kilometers, we spotted a single tusker elephant on the meadows to the left of the road. It was away and was partially hidden in thick undergrowth. 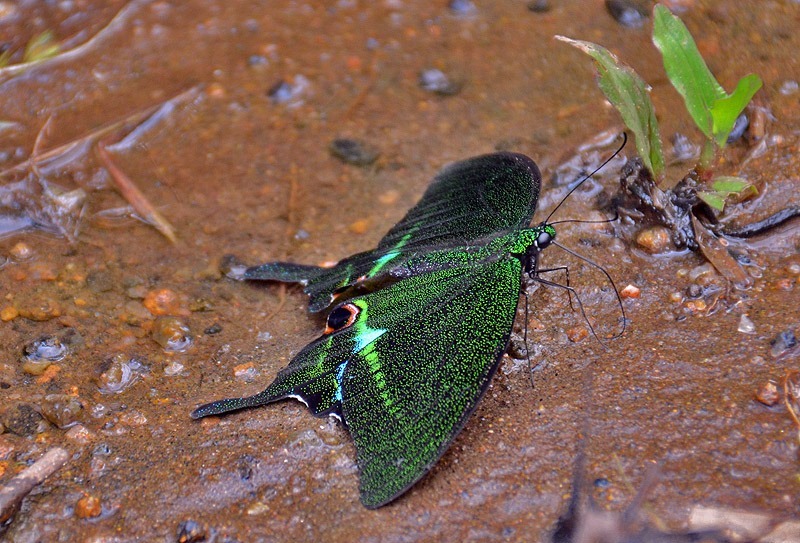 We also spotted different types monkeys and came across beautiful butterflies. When we were driving to Gavi, a lot of tourists were returning from their day trip at Gavi in hired jeeps. One of the jeeps slowed down and the driver asked us in Tamil whether we had seen the elephant and where it was located. My brother replied in Tamil. The exchange went on for a while in Tamil and suddenly the jeep driver asked us whether we are malayalees in Malayalam and we replied – Yes! He literally did the face palm. His embarrassed reaction was quite amusing. He assumed we were Tamilians since our vehicle number started with TN! The road here is narrow, but is in pretty decent condition. We went slow and reached Gavi around 3pm one hour late than our planned check-in time. When you drive through forests, keep the speed low at around 15-25km/hr. This way you have a higher chance of spotting wildlife. Also slow down when you are at a curve and be prepared to spot wildlife just around the curve. Here is another technique I use when traveling with family. I ask my wife to look for wildlife in the trees on one side and my children to look at the trees on the other side. 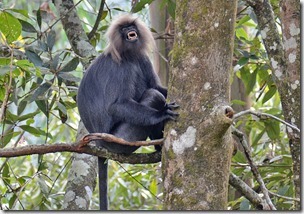 We have spotted lion tailed macaque, Indian giant squirrel etc. using this technique in most of our trips. We parked our car after the Gavi dam and checked in at the reception counter. All of us had to sign in a register and the receptionist told us about rules and regulations in a tiger reserve. We were also given an instruction leaflet, entry coupons and was assigned a guide (Kannan). Note that you will be signing a exclusion of liability which means that Gavi eco-tourism will not be liable for any personal injury. Kannan was from Gavi village and he had over 10 years experience as a forest guide. He was the best forest guide I have ever been with – knowledgeable, helpful, courteous and a true guide! The Swiss tents were located away from the reception/canteen/boating area on the other side of the Gavi dam. We walked along the road to reach the tent area located on the right side of the road towards Vandiperiyar. Guide took us till the tents, gave us the keys and said he will be waiting for us at the reception area and recommended we should go on the boat ride. The forest tent was neat and clean; mineral water bottles and other basic necessities were already arranged in the tent. A tea kettle and hot water facilities are also provided. The tent also had a proper attached toilet. All the tents faced the lake and you could spend hours relaxing in chairs provided in tents. I really wish I could afford spending a week here doing nothing other than reading and watching wildlife. If you are lucky you will be visited by deer, squirrels, monkeys and who knows even a leopard! We quickly deposited our bags inside, got ready and was on our way back to boating dock by 4pm. We had tea and biscuits from the canteen. Canteen and boat dock is located on the opposite side of the reception building. 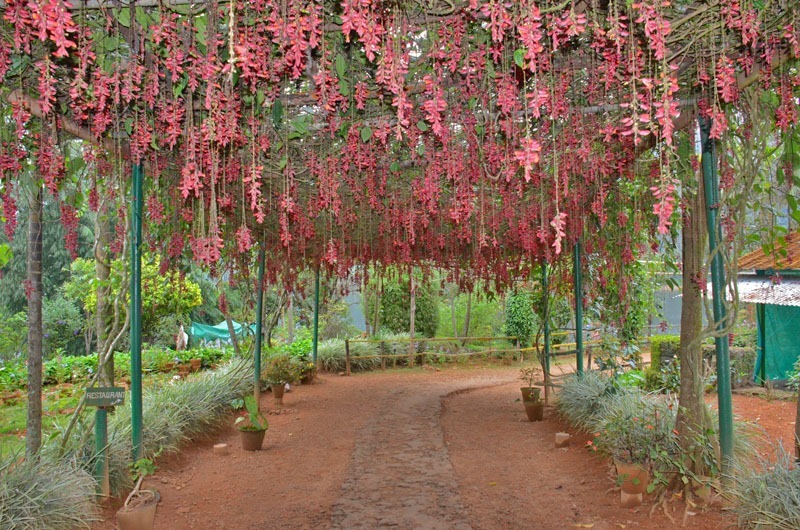 There is beautiful garden on the road side and you need to go through a tunnel decorated with a flowering plant called Clock Vine(Thunbergia mysorensis) to reach the canteen. Whoever planted this is a genius since it attracts a large number of small beautiful birds and combined with their sounds the whole place feels magical! When we came out of the canteen, Kannan was ready with a paddle boat and life jackets! The paddle boat requires some patience to get in especially for families with children. Always ensure that boat is steady and weight is balanced on the sides. Since it was late, almost all of the day trip folks had left and there were only few guests for night stay. We were the only ones on the lake. Kannan was also an expert on the paddle boat and patiently answered all our questions and queries. The lake was calm and serene. The silence and the misty lake gives a heavenly experience if you are a nature lover. Kannan took us to a waterfall nearby on the lake and since we were alone, we decided to take a quick dip in the river. 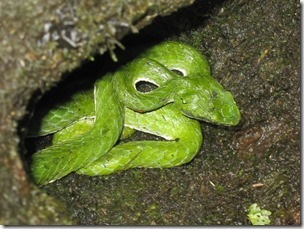 While walking to the waterfall, my daughter suddenly pointed us to a snake. This was my first encounter with green pit viper! Kannan told us that he will be in trance stage till it becomes dark and told us that getting bitten is fairly common when staying in the forest. 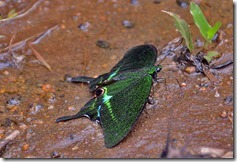 This gave us extra motivation to get out of the waterfall before night fall. After the boating, we sat on the benches near the canteen and just spend our time in front of the pristine and serene lake. It is a shame that such views are now available only for a price! At 7:15pm we were served with delicious chicken soup and was followed by a sumptuous non vegetarian buffet dinner. After dinner we went back to our tents since we were all tired after the long trip and boating. Kannan told us to be ready by 5:50AM for our 6:00AM jeep safari towards Angamoozhy (south bound). Before we slept we started hearing noises from the other side of the lake (the tents are adjacent to the lake). Our night security guy (John) came running to tell us that elephants are on the other side and we are safe since we are protected by the electrified fence. After he left, we went near the fence to see if we can get a glimpse of the elephant herd. 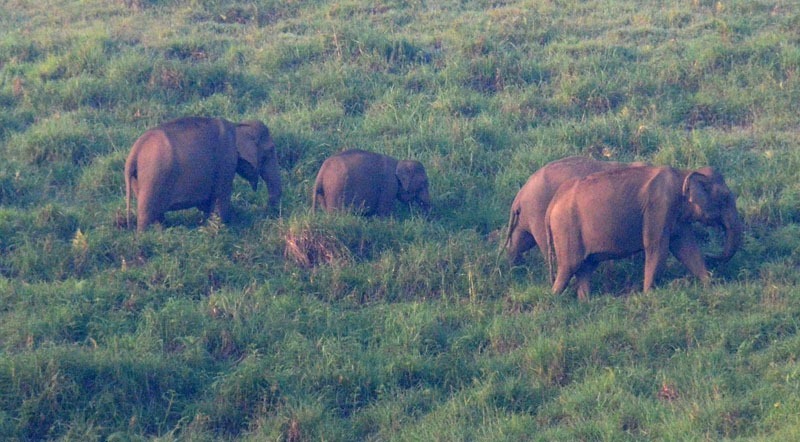 The elephants seems to have started crossing the lake and we could hear their breathing! Then we heard folks on the boat landing side making noises to scare the elephants away. This is required since the other area is not protected by electric fence. We went back to bed and heard various noises and howls till we slept. The tents are not for the weak hearted! 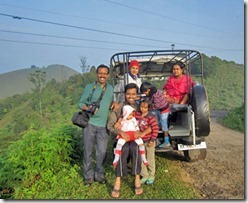 By 5:45AM we were all ready for a jeep safari and at exact 6AM Kannan was there with an open jeep. The jeep is hired by KFDC and is included in the package. However jeep drivers do expect tip and I always ensure that tip is proportional to their service. Kannan asked whether we want the jeep roof closed since we were with children and I noticed that our guide was very considerate and helpful. The open jeep ride was pretty exciting and we spotted multiple elephant herds along the way. We also came across a herd of gaurs on a meadow. The misty weather was the only disappointment. 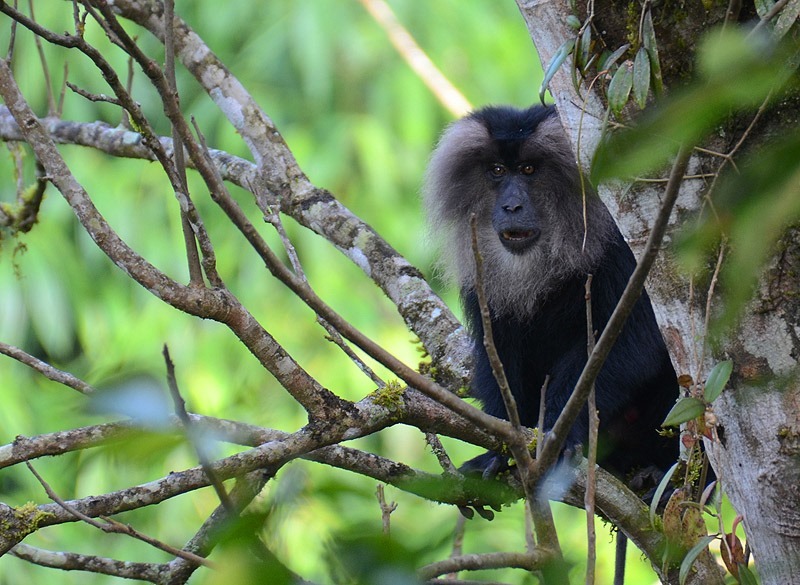 On the way back we got really lucky and spotted a big family of lion tailed macaque! While returning from Safari, our driver asked whether we want to stop for tea at a shop. He slowed down the jeep but I replied that we would have our breakfast from the canteen. My wife later scolded me for being selfish since the stop was actually needed for the driver/guide. We bought some snacks from the only restaurant at the Gavi village on the way back. After an excellent buffet breakfast consisting of bread toast, uppuma, aval with banana, omelette, pineapple/grapes etc. I set out with my brother and our guide (Kannan) for a trek. Our families went back to the tents for some rest. 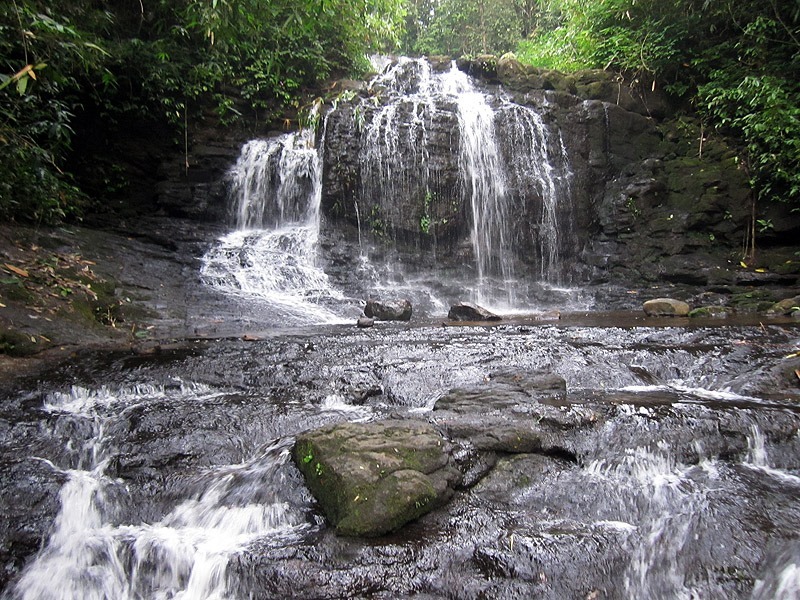 Gavi has around 25km of trekking path. The most preferred path actually starts from the other side of the lake after taking a boat from canteen area. This path is actually formed by elephants coming to the lake for water. 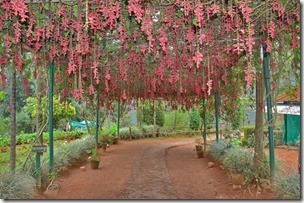 We started our trek casually and Kannan told us more about the flora around this place. We also came across fresh elephant dung. On our trek we reached upstream of the waterfall in which we had bath on the previous day’s boating trip. When you go on the trek, always stick with the guide and follow his instructions. Never make loud noises. Elephants can be deadly if you are too close to them and in a thick jungle it is easy to miss them until you are too close to them. When you are near an elephant herd, they usually give you warning with grunting sound and you should gradually move away from them by walking backwards. Never use flash when you are photographing an elephant herd in close range. 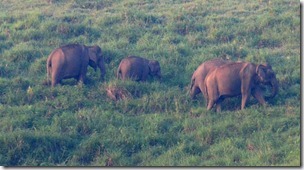 After an hour of trekking we came across a herd of elephants on our right side. We also met other trekking teams hiding and watching the elephant herd. All of us decided to move around the herd to get a good view. Then suddenly our guide indicated us to stop. He asked us to wait and then cautiously proceeded to the direction opposite to where the elephant herd was standing. He then indicated to join him without making any sound and then we noticed another herd of elephants coming from the direction that our guide has gone! Without our guide, we would have probably ended up right in front of these elephants! After the elephant encounter we proceeded to the southern part of Gavi lake crossed over and then reached the main road. We crossed the main road then headed towards the Sabarimala view point. 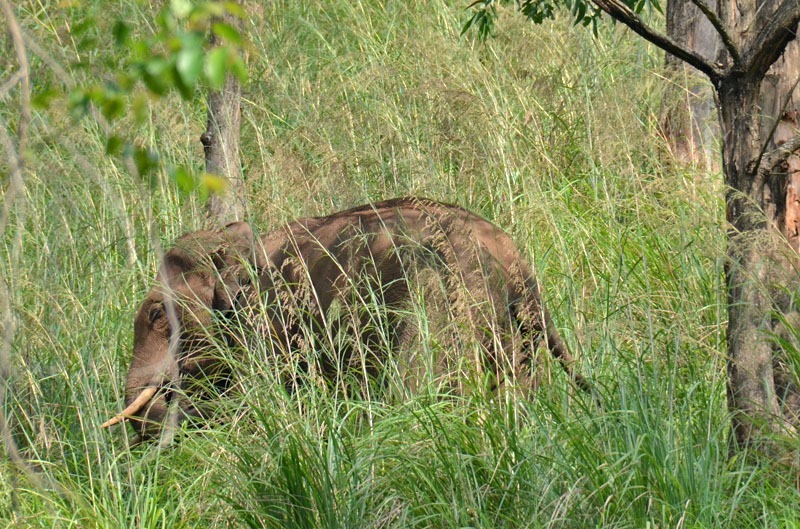 Even here you can spot wildlife and we spotted a Sambar. It was almost 1pm when we reached the view point. There was lot of mist and Sabarimala was faintly visible between Ponnambalamedu and Pullumedu. From view point it is 10 minute walk back to the Gavi reception area. On the way back we spotted a structure which looked like a tree house but it was small and stood on the ground. We were curious as to what it is and Kannan told us that earlier there was no BSNL mobile tower and hence the staff used to climb up this structure to get mobile signal! After a quick bath we went for the lunch. It was a sumptuous vegetarian buffet lunch with lot of side dishes. After lunch we took rest on the benches near the lake. By 3PM we checked out from the place, received our exit pass (which should be given at Vallakkadavu check post) and we were on our way back home. Surprisingly we didn’t find much of wildlife while returning back. 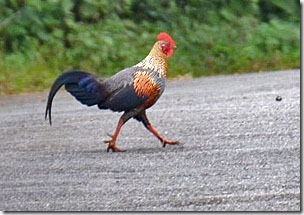 However Gavi gave us one last glimpse of its rich wildlife in the end; A wild rooster crossed the road majestically in front of our car reminding us that the place belonged to them! Always carry some salt with you for leech bite protection. Usually your guide will carry it when you are going on a trek. But even then it is best to carry some along with you. When you get a leech bite, the best way to remove them is to pour some salt on it. Leeches are fairly harmless if you don’t try to forcefully remove them. A binocular is highly recommended if you want to get a close view of Sabarimala. I usually carry a 10x Nikon. No activities are usually allowed before 6AM and after 6PM. At night It is a pretty good idea to be indoors. The dam and the buildings around do give a false sense of security, but remember that you are right in the middle of a forest with plenty of animals! If you are with small children, always ensure that you are near them! Alcohol is not allowed in Periyar Tiger Reserve. If you are crossing the border from Kumily, never bring alcohol bottles across the check post unless you like getting harassed, loosing the bottle and paying a hefty fine. KFDC has a more liberal view towards responsible drinking, but Kerala forest department doesn’t share this sentiment. If you are just staying for one day, the activities make it a hectic holiday. I recommend either staying for 2 days or skipping either the trek or jeep safari. When Sri Lanka became an independent nation in 1948, there was a large number of South Indian Tamils in the country who were originally taken there by British as estate workers. In 1948 Sri Lanka passed the Ceylon Citizenship Bill which denied citizenship to a large percentage of Tamils. In 1964 Indian Prime Minister Lal Bahadur Shastri and Sri Lankan Prime Minister Sirimavo Bandaranaike signed the Sirima-Shastri Pact under which India agreed to give Indian Citizenship to about 525,000 Tamils. Around 150 Tamil families from Sri Lanka were rehabilitated on the cardamom plantations near Gavi and Pachakkanam. 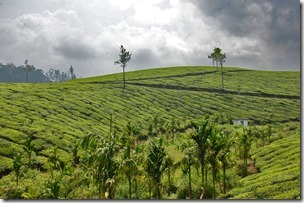 Later these plantations came under Kerala Forest Development Corporation (KFDC). Even after 40 years, Tamils are still struggling to have a decent life and recent inclusion of Gavi and surrounding areas into Periyar Tiger Reserve made their life much more difficult. It is a sad fact that the our activities to protect tiger doesn’t take into consideration the hardship suffered by the local human population. Even their right to travel is pretty much restricted due to multiple check posts along the way. Now there are around 1500 people (400 families) living around Gavi and Pachakkanam. KFDC is also doing bad in cardamom business which in turn affected livelihood of Tamils living there. The Gavi Ecotourism project gave KFDC much needed money and it also is currently giving the local population a decent way to live. Most of the younger population now work as expert forest guides or staff for the Gavi Ecotourism project. 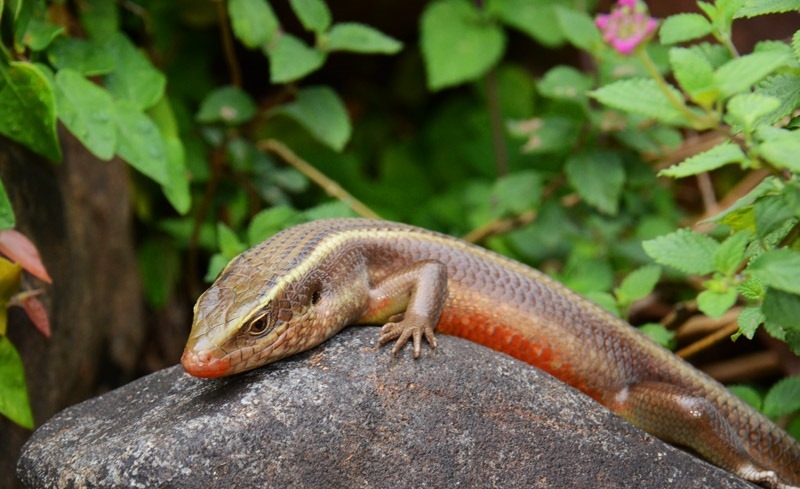 Gavi is a paradise for nature/wildlife lovers. It is a suitable destination for families and bachelors with an interest in nature. When it comes to material comforts, what is provided is basic but yet sufficient to keep you happy.